Not soft buttermilk rolls. Or potato rolls. Or even sweet honey wheat dinner rolls. This roll is much bigger than that. 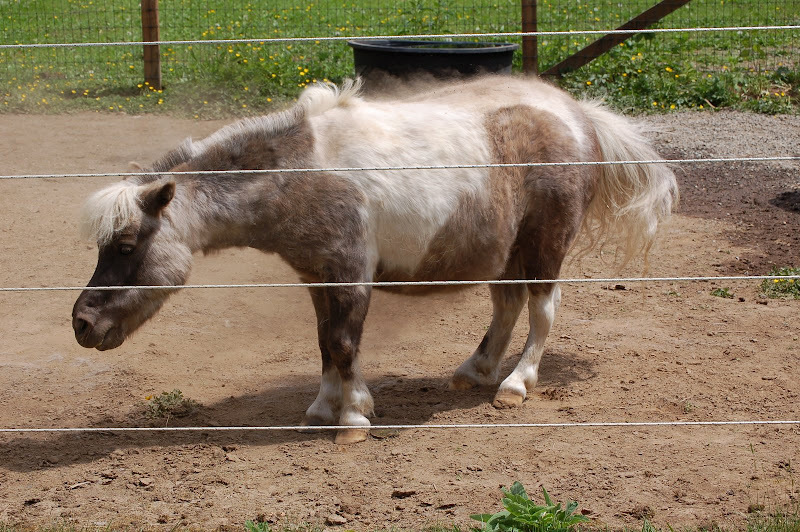 First, start with a rather "fluffy" 31 inch miniature horse. Add some leftover winter coat, long enough to trap any minute particle of dust that floats it's way. 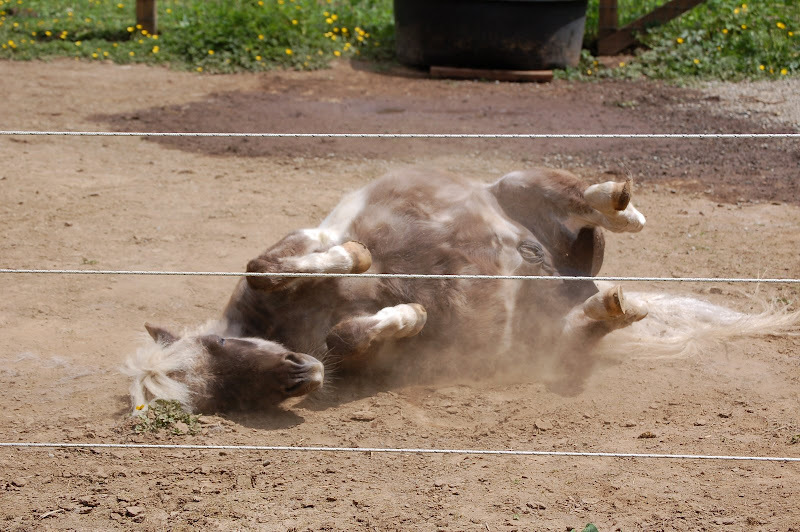 Be sure the horse has large white patches in his coat so you know when you get him good and dusty. The white is merely a figment of your imagination, a thing of the past! Lay the miniature horse on his side and roll him back and forth, covering him with dust and grinding it deep into the coat so it can't be removed easily...or maybe ever. Continue rolling the mini, layering the dust, not leaving a single square inch untouched. This adds weight to the entire horse so he can't blow away if the wind picks up. It allows you to find him in the pasture later by following the telltale path he leaves behind, a variance on the bread crumb theme. Stand the mini back up. Have him shake ever so slightly, not disturbing the layered dust, only casting a choking cloud upon himself. Notice how the little horse glances lovingly at you with his large, liquid, soft brown eyes. Feel the trance cast over you. Uncontrollably you are drawn to the filthy little fuzzball. Holding your breath you give him a huge hug and tell him how much you love him. You tell him he is your "best-est" friend and the cutest little horse in the world. You mutter, "I love you." You make a fool of yourself. He smiles back, bats his long eyelashes and says, "Of course you do." Then the tremors start. You try to break free. It's hopeless! You are held captive while most of the dust in a 3 county area is shaken upon you. Wonderful post....looks like he got WELL dusted. Bet it felt good too. Nice pictures. Wait till they have a Cardi (or two) to roll with them -- it will make for some great video! 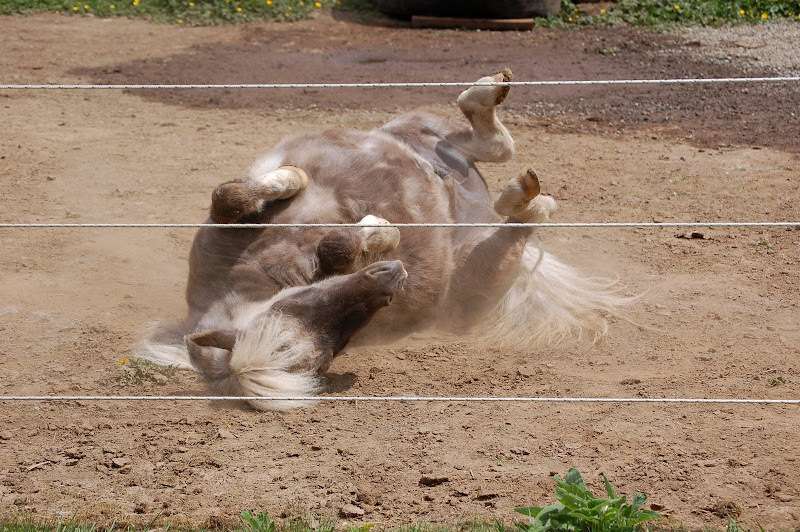 A good roll is usually a sign of a healthy happy horse. I don't know how they keep from twisting their guts doing it though.